Forgotten Records’ reclamation of Louis Kaufman’s LP legacy continues at a brisk pace with this latest example of the consummate tonalist’s artistry. The repertoire also makes a lot of sense, devoted to composers born between the years 1681 (Telemann) and 1692 (Tartini) by way of Bach, JS. The former two composers also attest to Kaufman’s unusual diligence in seeking out old music in archives and in his editorial responsibilities in bringing it to life in performance and on disc. The first work, however, is Bach’s Concerto in E major where he is joined by a long-standing friend and collaborator, Jacques Rachmilovich. Their recording of the Khachaturian Concerto made with the conductor’s orchestra in Santa Monica was quite an ear-opener for its time, made just after the end of the War, and it’s been transferred to CD. They also recorded the Saint-Saëns No.3 together. The Bach however is a sad disappointment. There’s a Gatling gun attack from the lower strings that is positively unpleasant and the speeds in the two Allegros are uncomfortably fast for proper articulation; it’s as if Kaufman’s fabled tone hasn’t enough time to expand before he’s harried on to the next phrase, though presumably he was not wholly innocent when it came to the choice of tempi. His own accompanying figures are also over-recorded. In the slow movement his succulent, indeed tremulous approach is more the Kaufman known and loved by posterity but in an era when recordings by such as Busch, Menuhin and Huberman were freely available this was then, and now, a non-starter. The thoughtlessness and indifference of the Bach Chamber Symphony Group is shown up by Kaufman’s solo rendition of the Sarabande from the First Partita. The recordings were made in 1945. Thenceforward things improve appreciably. 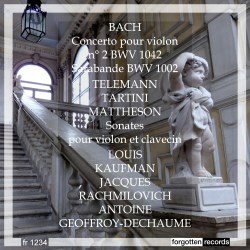 The Telemann and Tartini sonatas enjoy the accomplishment accompaniment of harpsichordist Antoine Geoffroy-Dechaume, less well-known perhaps than Veyron-Lacroix – at least on disc – and perhaps a more fragile performer but one who lends perceptive support to Kaufman. That said, the tension between his style-conscious playing and Kaufman’s old school burnish is certainly ear-titillating and more overtly so, in fact, than the meeting a few years before of Campoli and George Malcolm in Handel sonatas. The 1955 Parisian studio sound is typically dry but Kaufman’s tone transcends the limitation in its vivid and ardent singing warmth, rich cantabile and luscious Kreisler-derived slides. This is explicitly encountered in the slow movement of the (second) Telemann sonata and the glamorous lyricism, redolent of Elman and Seidel, of the opening of the (first) Telemann. Kaufman later edited a series of Telemann sonatas which he recorded with harpsichordist Frederick Hammond and they can be found on Music and Arts. The rarely encountered Johann Mattheson sonata is finely played though the third movement doesn’t sound much like a Gigue in this reading. These successful restorations have dealt very well with the vagaries of the original Tempo and Lyrichord LPs and Kaufman collectors will welcome the chance to fill the gaps which this disc offers.